Ever feel confused or overwhelmed after a doctor’s appointment? Forget to ask important questions or bring up new symptoms? Covering all of your concerns in a 30-minute appointment can be tricky. 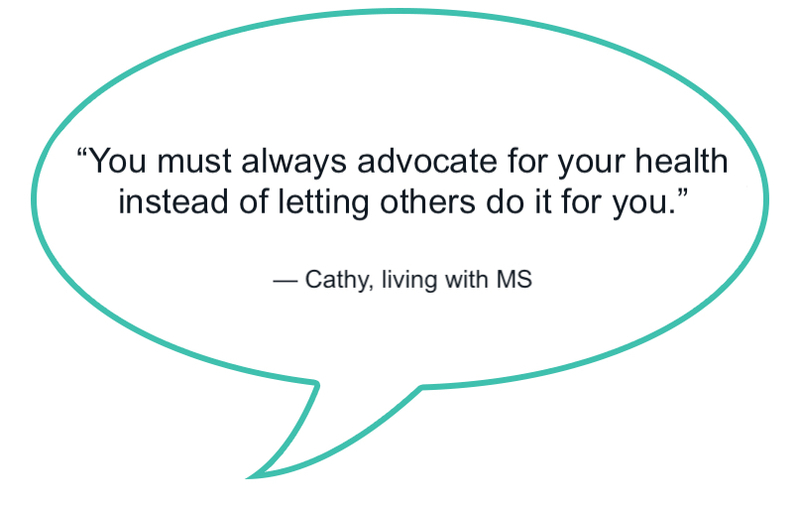 MS community member Cathy can relate — read on to see how she’s learned to make the most of her appointments and check out her 7 tips for getting the answers she needs. In 1986 I noticed something was awry when my legs were completely numb, my arms were weak, and I was always physically exhausted. I felt scared, isolated and confused. I scheduled an appointment with my internist who referred me to a neurologist. After a spinal tap and CT scan the tests were conclusive. 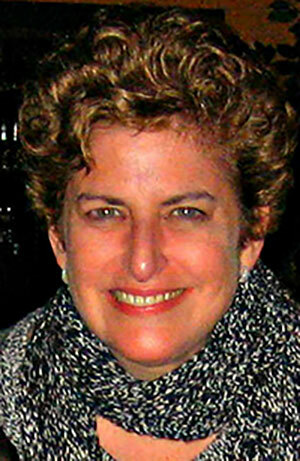 I had multiple sclerosis. I was happy to have a name for what I had but that didn’t diminish my confusion. I decided my neurologist would lighten my emotional load at my next appointment and, like Scarlett O’Hara, I’d think about it all another day. In hindsight I realize this was not a good plan. One of the most important lessons I learned over the last three decades is you must always advocate for your health instead of letting others do it for you. Self-advocacy must be our number one priority. In today’s health care climate, when doctors are often inundated and pressed for time, it’s crucial to get answers to our questions during the thirty minutes or so of medical appointments. Organize your medical history by having copies of medical records, x-rays, scans or other lab tests and the names/phone numbers of previous doctors. You can have these sent directly to your doctor from your previous doctor (you will first need to sign a consent form) either before your appointment or bring them with you. Leo van Biene doctors make the whole experience effortless and stress-free, this is to make the doctors as welcoming as possible so you an focus on your health and not the appointment. Keep a journal of your symptoms. It does’t need to be elaborate, just a word or two to help you remember. Bring a list of questions with you. I keep a piece of paper on my nightstand to write down questions and concerns I have. Do not leave your appointment until everything on your list is addressed. Ask a family member or friend to come with you to help explain your symptoms, or to be a good listener and take notes. Be specific about your symptoms, how they affect you and when they happen. Bring a list of any medications and supplements you are taking including dosage and inform the doctor of any allergic reactions to medications. Request a brief verbal summary and follow-up instructions to review what was discussed. If you’re nervous or need extra time to process information this review can be particularly helpful. Remember that you and your doctor are managing your health as a team. The more prepared you are for your appointment the stronger your team will be! How do you prepare for a doctor’s appointment? Anything you’d add to Cathy’s list? Join PatientsLikeMe to chime in and get more tips from the community. I learned early in my dealings with work comp doctors to type up a list of questions/concerns to take with me when I see a new doctor (and sometimes I’ll bring an article I read too)!! Way back in 1996 before my 2 level cervical fusion (the first surgery I ever had) – it really made my dr nervous, but he would answer all my questions (I ‘d write down the answers) & after the first visit he got used to it & it wasn’t a big deal & I had the answers in writing (so I could research them further when I got home)! What do we do when we have questions at a doctor’s and they say you came in for this question, you will have to make an appointment for other concerns. I just changed primary care d off of because when I left appointment I knew more about his family, animals, and there life. Now this new doctor, I had scheduled a pap test because my gynecologist retired, and because I am just 72, she told me they don’t do this on women over 65. So they cancelled the appointment! Really!